Welcome to your best choice of hotel in Yucca Valley CA, the 100-percent smoke-free America’s Best Value Inn and Suites Oasis of Eden– offering regular and special themed rooms. Our newly renovated hotel provides you excellent value no matter whether you’re visiting the area for business or pleasure. If you’re looking for hotels near Joshua Tree National Park or one of the many other nearby attractions or points or interest, we’re the place for you. In fact, Joshua Tree National Park, the nation’s newest national park, is less than 7 miles away when you stay in affordable comfort with us. Joshua Tree Retreat Center is about 4 miles away. For the best shopping and golfing in California, visit Palm Springs, just 30 minutes away. Amenities intended to make your stay even better than you’re expecting include an outdoor pool available from May to September, a hot tub and more. In-room amenities include free wifi, mini-refrigerators, microwaves, flat-screen televisions with premium channels and more. 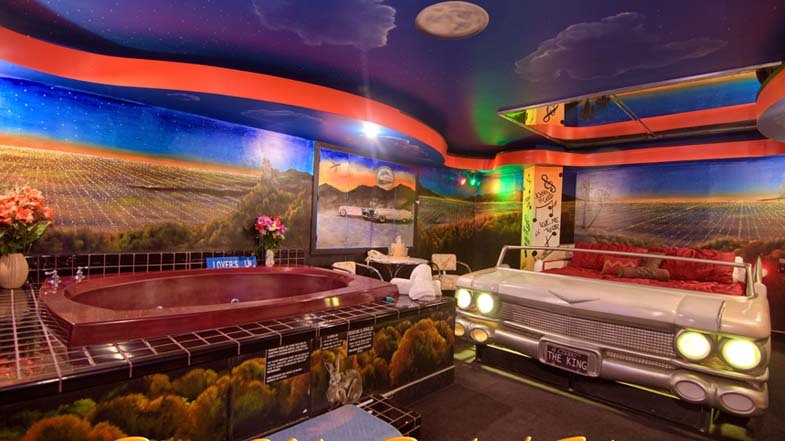 We feature 14 themed rooms with hot tubs, including our Rockin’ 50s room with a king-size 1959 Cadillac bed, a cave room, jungle safari rooms and Asian-themed rooms. Additional accommodation choices include executive suites, courtyard or garden area rooms and standard rooms for budget-minded travelers. All regular and themed rooms feature extra-comfortable beds and are available for special weekly and monthly rates, including for corporate assignments or extended business trips. Direct billing is available. 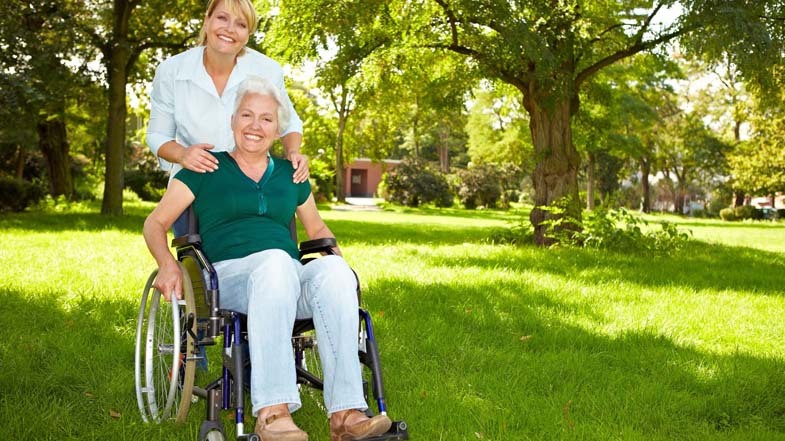 You’ll also benefit from our excellent service. We’re a different kind of hotel with a unique experience and exceptionally well-trained and capable staffing. For the very best hotel in Yucca Valley CA, all you have to do is book now with our ABVI. Whether you’re looking for hotels near Joshua Tree National Park, our unique themed-room experienced or a comfortable extended stay while on business, we’re here for you. Looking for the right hotel in Yucca Valley CA? Business travel is easy, comfortable and very affordable when you choose ABVI Oasis of Eden, your first and best choice of Yucca Valley 29 Palms Highway hotels. When you’re simply wanting a home base while you handle business around the region, we're here for you with extended-stay rates and corporate billing options. Turn to us with confidence when you need a business hotel that will more than meet your expectations. We're the best overall choice in the area – your very best choice of places to stay in this part of the state. In fact, we’re a smart alternative to expensive Palm Springs, California hotels as well. Looking for a hotels near Joshua Tree National Park or perhaps simply an affordable choice of motels in Yucca Valley CA? Maybe you need a place where you can settle in and stay for a while. Whatever your need, we're here with the family-friendly experience you need and deserve. We provide the best choice in this part of California no matter what brings you to town. Why not stay with us? We have proven ourselves a smart choice for so many others, and we will provide you with a great experience too. We’re more committed to our guests than ever at this top choice of hotels in Yucca Valley, California. If you want a comfortable choice of Yucca Valley CA hotels – perhaps hotels near Joshua Tree Retreat Center – you're looking in the right place. Are you looking for a place where you can relax and recover a bit? Perhaps you're looking for a perfect choice of Palm Springs hotels but don’t like the high prices there. For a comfortable stay no matter what brings you to the area, we have what you want at this property. As the sensible choice of hotels in this exciting region, we feel an obligation to provide exceptional comfort at a fair price. Plus, we take real pride in offering amenities that enhance comfort as well. Seeking hotels in Yucca Valley CA where you can find some peace and quiet during your stay? Looking for Joshua Tree National Park hotels where you can feel safe before and after your big day out? You deserve a safe and peaceful stay, no matter where you travel. When you need to visit our part of California, staying with us at ABVI Oasis of Eden is a great choice sure to lead to exceptional value, amazing comfort and the safest, most peaceful stay you can imagine. We take great pride in being a quiet, safe and cozy hotel where you can stay in peace, sleep well and wake up to a great morning. Hi-Desert Nature Museum is surprisingly compelling and is near our Yucca Valley CA motel. Why not explore it since you’re in the area anyway? Sagebrush Press Bookstore is sure to have a tome for you, and you’re close at hand when you stay at this ABVI in Yucca Valley, California. Yucca Valley Chamber of Commerce serves as your visitor’s center in the area and looks forward to meeting and welcoming you. We’ll help you find it. At this ABVI, we strive to offer the best overall experience and to excel above other hotels in Yucca Valley, California. Amenities intended to make your stay with us in this unique and vibrant area near America’s newest national park even better than you’re expecting include an outdoor pool available from May to September, a refreshing hot tub and more. 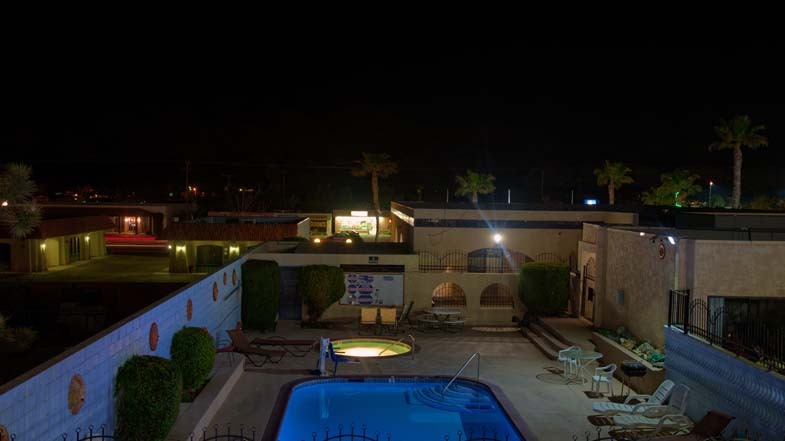 We’re more than just an ordinary choice of hotels in Yucca Valley CA. We feature 14 special themed rooms, including our Rockin’ 50s room that Elvis might have liked with a king-size 1959 Cadillac bed as well as a cave room, some jungle and safari rooms and Asian-themed rooms too. If you’re looking for hotels near Joshua Tree Retreat Center, you’re looking in the right place for comfort and convenience. In fact, Joshua Tree National Park, America’s newest national park, is less than 7 miles away when you choose America’s Best Value Inn. Joshua Tree Retreat Center is about 4 miles away as well. This website is owned and maintained by Americas Best Value Inn & Suites Yucca Valley a licensed user of certain proprietary trademarks and service marks of Vantage Hospitality Group, Inc.